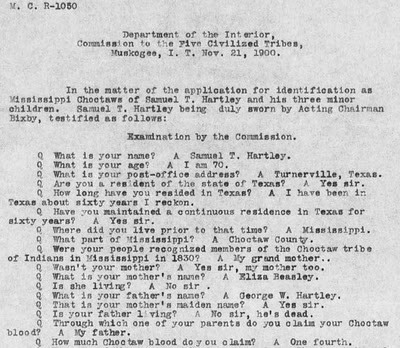 Two Mondays ago, I transcribed the decision letter written by The Dawes Commission concerning my Hartley ancestors. This letter mentioned the parents of my second great grandmother, Sarah Hartley Denyer Foster, as provided in the testimony of her brother, Samuel: George W Hartley and Eliza Beasley. However, the letter also mentioned another possible mother - Ann Fisher. 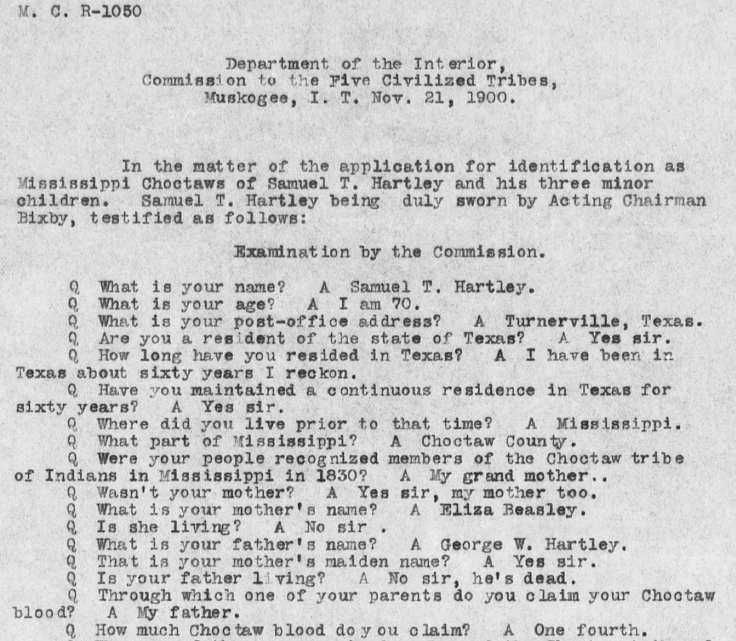 It also appears that all of said applicants claim rights in the Choctaw lands under article fourteen of the treaty between the United States and the Choctaw Nation, concluded September twenty-seventh, eighteen hundred and thirty, by reason of being descendants of one George W. Hartley, and from Eliza Hartley (nee Beasley) (or Ann Hartley nee Fisher) who are alleged to have been three quarter blood Choctaw Indians and to have resided in Mississippi in eighteen hundred and thirty. Samuel T. Hartley clearly states in his testimony that his mother was Eliza. One assumption that could be made is that if there was a second mother for George Hartley's children, Ann Fisher was likely the mother of Sarah. But that would be an assumption. 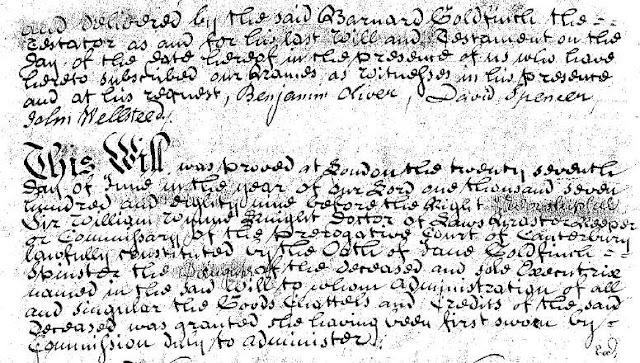 It's also possible Samuel may have said his mother was Eliza, but later admitted in some document I don't have, that his mother was actually Ann. Or perhaps this chart was drawn up by the commission, and Ann's name got added there accidentally by some strange unknown series of events. Is there any evidence that might support the theory that Sarah's mother was Ann? Any evidence that might suggest otherwise? Yes, and Yes. 3) One might ask who was the older child -- Samuel or Sarah -- and whether there is any evidence of which wife/mother came first. In Houston County, Texas, there is an Eliza Hartley (32) living with two sons, Samuel (18) and William (6). They are in the same household as the family of "Elijah and Margaret Wheeler." Samuel claims in his testimony to have been born in 1830, so this isn't too far off. However, there is no Sarah. There is a Sarah Hartley (14), in another Houston County, Texas household. Working as a farmhand for Hardey and Sarah Ware. Her birth year would be 1836. 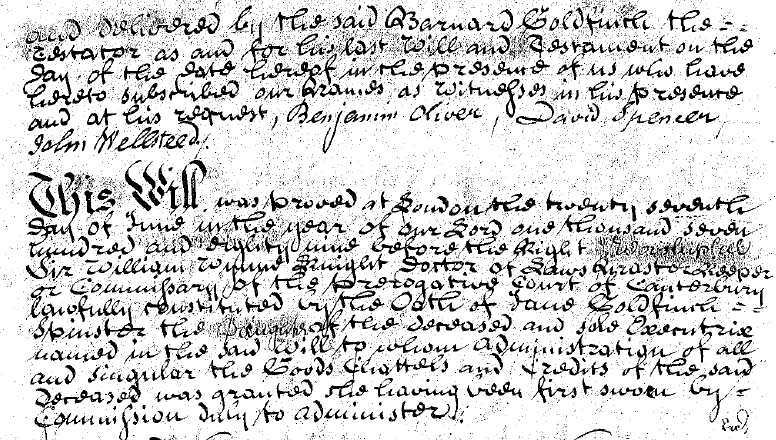 Sarah Hartley married Ebenezer Denyer (I have a copy of the marriage certificate) There are no ages given. Sarah is recorded as age 30. Ten years later, and she's 2 years younger! But because of her husband, I know she's the same woman. Sarah is recorded as age 44, putting her birth year back to 1836. Her daughter Eliza Caroline Foster Reeves testifies to the Dawes Commission that Sarah was 66 years old when she died in 1898, suggesting she was born in 1832. While her exact birth year is open to question, I am fairly certain that Sarah was younger than her brother Samuel. 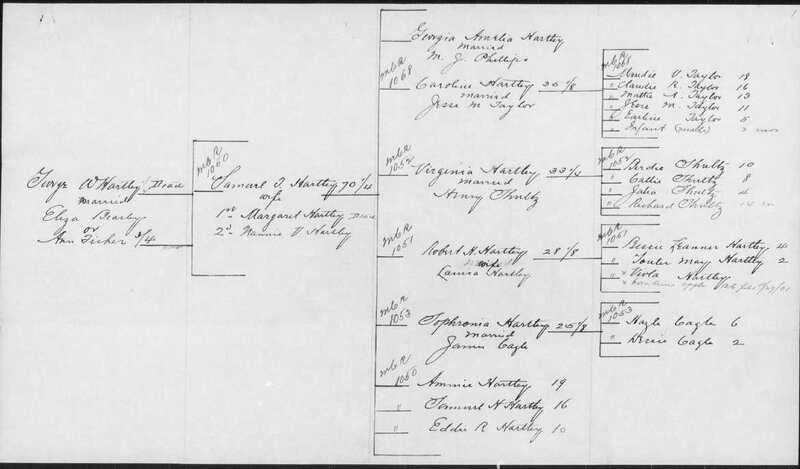 If that is their mother, Eliza (Beasley) Hartley in Houston County, Texas in 1850. And if Ann Fisher and Eliza Beasley were both wives of George Hartley, that means Ann was the first wife. Of course, either Ann or Eliza could have been a mistress. So this conundrum isn't solved. If Ann Fisher's appearance in the Dawes Commission documents isn't a mistake, she could be the mother of either Samuel or Sarah. 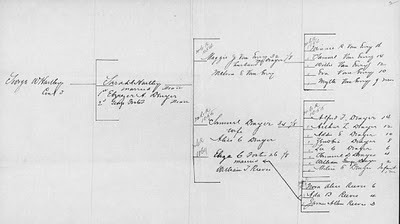 Since her name doesn't appear in any of the testimony, and I have no idea how her name got introduced into the documents, I have recorded Eliza Beasley as the mother of all three children (including the William who appears in the 1850 census), and relegated Ann Fisher to the notes section of my database until I learn more about her. The theme for the 98th Carnival of Genealogy is: "Document Analysis! 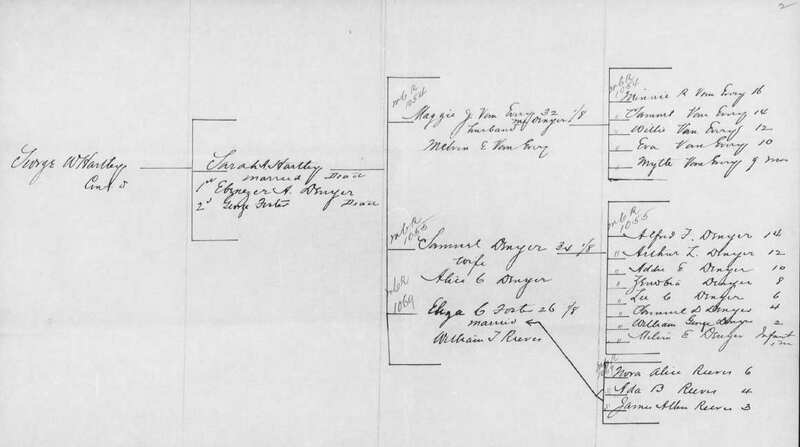 Show us a document that helped you break down a brick wall on your family tree. Discuss the information that appears on the document and how it contributes to your family history." The term "brick wall" can be used to define almost any barrier we arrive at in our research, but is often used in genealogy circles to describe those ancestors for whom we know nothing about their parents. There might as well be a brick wall beyond this ancestor, because we can see nothing beyond them. Since we don't know their parents, it usually means we also are uncertain about when they were born. Using this definition of "brick wall," I, personally, have only managed to knock down parts of three on my family tree. I have found the research of other genealogists online, and in libraries, that helped extend the generations my immediate family knew about. However, I didn't break down these walls, someone else did before me; thankfully, they wrote the information down for me to find. These walls are mostly on my maternal side, as my paternal brick walls mostly lay in countries where English is not the spoken language, and the online records are sparse. One brick wall I may have knocked down half-way, is that of Jane Goldfinch. As I blogged about in July, I found the will of a Barnard Goldfinch, who looks very likely to be Jane's father. I still don't know her mother, though, so the wall isn't completely cleared away. Another half-wall toppled does reside on my paternal branches. My paternal great great grandfather Selig Dudelsack arrived in the US in 1890. My family knew the name of his mother, Gertrude, or Gitel. We believe her surname was, "Slupsky," though this hasn't been verified. In this case, finding the name of Gitel's father was the most simple of my genealogical breakthroughs. All it took was a trip to a cemetery. Some documents are carved in stone. It turned out Gitel made the trip to America with her son, and is buried next to him. The tombstone doesn't provide a surname for the father. The family came from Poland or Russia, and may not have had a surname until sometime between 1821 and 1844. It's possible neither her father, nor Gitel, were born with one. I did learn that Gitel named her son, Selig, after his grandfather. 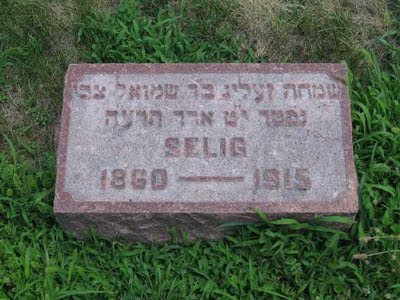 Selig's tombstone indicates his full Hebrew name was, "Simcha Zelig," too. I will devote an entire post to the other wall I have chiseled away at. The big news of the week was Ancestry.com's acquiring of iArchive/Footnote.com. Tamura Jones at Modern Software Experience discusses this and several other recent acquisitions since Ancestry's IPO last year. Craig Manson at GeneaBlogie has put together a list of perspectives on the news from various geneabloggers. Karen at Genealogy Frame of Mind and Travis LeMaster at TLGenes discuss the difference between a "Name Collector" and a "Genealogist." Schelly Talalay Dardashti at MyHeritage Blog discusses Diaries: a family history source. Lisa Louise Cooke at Genealogy Gems News discusses the return of Dear America, a historical fiction series of books for kids from Scholastic. Daniel Hubbard at Personal Past Meditations was recently visited by a physicist friend - and he found some similarities. Particles leave paper trails. We can't see or hear the particles, just like we can't see or hear our distant ancestors. Read more in Building An Ancestor. Karen at Ancestor Soup wonders how our ancestors survived lunch. Two Polish Neo-Nazis discover an unsettling truth (for them) at a local historical society. They are no longer part of the movement, but instead, have converted to the religion of their ancestors. On a local note: Paul Hohmann at Vanishing StL sees a St. Louis intersection devastated by a tornado in Life Magazine's online photo archive. He doesn't recognize the intersection at first, but tracks it down. The post contains several photographs, and a 1909 Sanborn map. At Moultrie Creek Gazette Denise Barrett Olson considers using Twitter for news. Research at University of Notre Dame shows child rearing practices of our distant ancestors had positive results. The genealogy bloggers below provide their selections for the week - many different from my own. Lisa at Are You My Cousin? This just happened -metaphorically - in the genealogy universe. Ancestry.com acquired Footnote.com's parent iArchive. The two websites are basically #1 and #2 with respect to fee-based historical/genealogical databases. The modifier is necessary, since some might nominate FamilySearch for #2, but for religious reasons they give away all their information for free. And that may just be one of the reasons for the acquisition. It can be difficult for for-profits to compete with not-for-profits on the same playing field. These are just my initial thoughts. We will of course have to wait and see what happens. This week I return to the documents I began Amanuensis Monday with - back in February of 2009: The testimony given by my ancestral kin on their Choctaw ancestry. Below is the official decision letter from the Dawes Commission. Dear Myrtle raises a question about Political Correctness, and whether or not we transcribe a document word-for-word, or whether we (leave out/edit) parts that may be misunderstood out of context. James Tanner at Genealogy's Star shares his thoughts on the topic. Tana L Pederson at the Ancestry.com Blog answers some questions on FamilyTreeMaker 2011. I was excited to learn that the Mac version is slated for release within the next two months. GovGab writes about the Penning of the Star Bangled Banner 196 years ago. Thomas MacEntee at GeneaBloggers has introduced on his blog a daily Genealogy Blogging Beat, with multiple blogging themes each day to help inspire those seeking ideas for posts. MyHeritage Blog lists their choices for the "10 weirdest, funniest, most intriguing genealogy tweets"
I'd like to welcome all newcomers (and oldcomers) to this weekly blogging theme. I suspect participants have increased this week in part due to Amanuensis Monday being included in Monday's Genealogy Blogging Beat at GeneaBloggers. Randy Seaver at Genea-Musings shows where you can look to see what databases may be upcoming in future weeks and months at Ancestry.com. A video at NARAtions asks Are You a Citizen Archivist? Their definition focuses on Independent Researchers at the National Archives, but I can't help responding with a, "yes!" Of course, my research isn't yet in a local, state, federal, or private archive. Martin Hollick at The Slovak Yankee wonders how to leave his research for the next generation, and whether or not they will be interested in it at all. 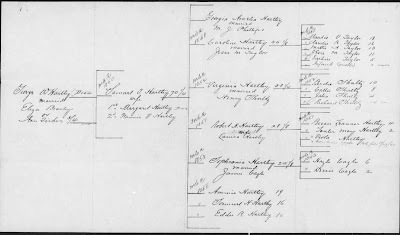 James Tanner at Genealogy's Star has done a lot of scanning over the years. He calculates that he has scanned 70,000 documents, and he is only half way done with what he has now. Some of this work has been archived at the Family History Library. On Open Thread Thursday at Geneabloggers Thomas MacEntee asked for input on Daily Blogging Themes, and as a result Geneabloggers.com will be promoting more of them. Carol at Reflections from the Fence reminds us about the importance of geography in genealogy. GovGab reminds us that September is National Library Card Sign Up month. And hopefully every genealogist knows how important the local library can be to our research. On the sixth anniversary of his blog, Geneablogie, blogger Craig Manson sorts his selections for the Major Leaguers of the Geneablogosphere into teams and divisions, ala Major League Baseball. Those who conduct searches at Google (actually going to the website, instead of entering search terms in the box in the upper right of your browser) likely noticed a major change this week. Instant Google provides results as you type - predicting what you're going to type. Levi Sumagaysay at Good Morning Silicon Valley looks at whether or not this is a "Game changer," "SEO killer," or something else. In observation of Labor Day, I am taking a holiday from my personal Amanuensis project. Next Monday I will continue my project to transcribe family letters, journals, audiotapes, and other historical artifacts. If you choose to participate in Amanuensis Monday and post your transcriptions today, feel free to add a link to your post in the comments. Kimberly Powell at About.com Genealogy reminds us Don't Always Believe What You Read in the Newspaper. Sherry Lindsay at ProGenealogists discusses the importance of remembering the reason a record was created. 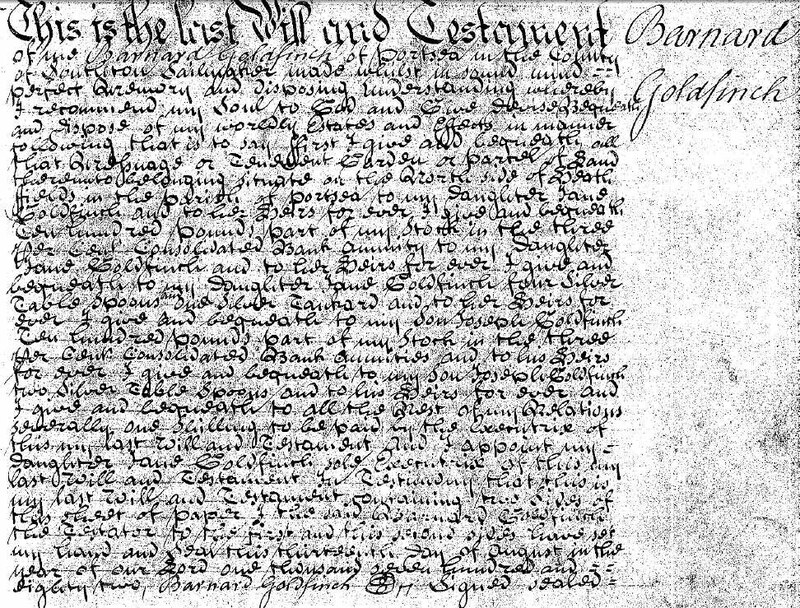 As much as we may wish it were otherwise, most documents weren't created with genealogists in mind. Pam Schaffner at Digging Down East discovers and illustrates a useful Excel timeline template. Randy Seaver at GeneaMusings explores The Learning Center, one of AmericanAncestors.org's free offerings. On Open Thread Thursday at Geneabloggers Thomas MacEntee asked some questions regarding The Content Wars. The discussion that followed in the comments is worth reading. NARAtions announces that the National Archives has over 300,000 Alien Case Files - indexed at the ARC and searchable, but you will still need to order the copies. The 97th edition of the Carnival of Genealogy has been published. Nine participants chronicled what they were able to find in 2-3 hours online for a person they hadn't researched previously. Details for the 98th edition are revealed. The September 2010 edition of the Graveyard Rabbit Carnival has been published, with discussions of celebrity graves. WIRED magazine explains the hidden connection between e-readers and sheep. The MoSGA Messenger reminds us Talk Like a Pirate Day is approaching! Ahoy! Lorine McGinnis Schulze at Olive Tree Genealogy Blog asks if Genealogy is a Hobby. Some may question whether they do this primarily for pleasure. Few would undertake the research involved if they didn't find the research pleasurable. But that doesn't mean we're doing it primarily to receive pleasure. Many of us, I believe, would argue we're doing it so future (or current) generations will benefit from our work. Even those who feel genealogy fits the dictionary denotation of 'hobby', may feel they don't like the 'colorations' society has placed on that word. So they may seek other choices. Where to seek them? Remember: Since the thesaurus doesn't know the exact context for which you are using the word, it will provide you with a list of words/phrases with similar meanings. Labor of love, Quest, Compulsion, Pursuit, and Adventure all seem to fit for me. However, I have a joy for puns or wordplay, so the choice of undertaking has a certain appeal.